Anthony Watts puts up an article slamming the chart of Roy Spencer and John Christie and Christopher Monckton's charts all in a few words. All his commenters agree they are nonsense. They've run out of arguments against "warmists" so now they are attacking each other. Good to see. This is reflected in the graphs Monckton publishes above (Sou: see below), where the AR5 trend line is the average over all of these models and in spite of the number of contributors the variance of the models is huge. It is also clearly evident if one publishes a “spaghetti graph” of the individual model projections (as Roy Spencer recently did in another thread) — it looks like the frayed end of a rope, not like a coherent spread around some physics supported result. 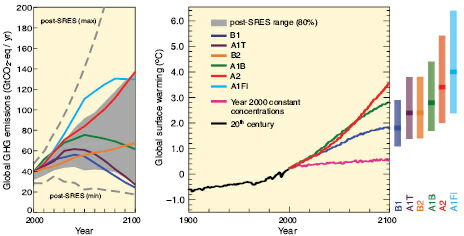 Note the implicit swindle in this graph (Sou: he is referring to Monckton's chart as shown below) — by forming a mean and standard deviation over model projections and then using the mean as a “most likely” projection and the variance as representative of the range of the error, one (Sou: ie Monckton) is treating the differences between the models as if they are uncorrelated random variates causing >deviation around a true mean!. The rest of his article reads as if it's written by a person (maybe a physicist) who doesn't know anything about climate science. rgbatduke says as much, admitting his "comparative ignorance". It comes across as the logical fallacy of personal incredulity. 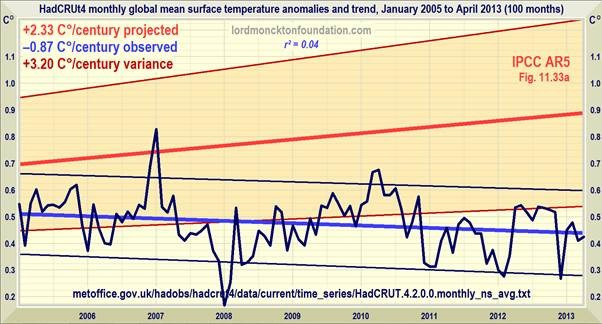 June 18, 2013 at 5:24 pm An excellent post – it would be assisted if it had Viscount Monckton’s and Roy Spencer’s graphs displayed with references. June 18, 2013 at 5:43 pm damn. just damn. June 18, 2013 at 6:02 pm I believe you’re correct. I’m not smart enough to know if what you are saying is true, but I like your logic. Posting this on WUWT tells me you are not afraid of critique. Everyone knows nobody gets away with bad science or math here. June 18, 2013 at 6:04 pm WINNER!!!!! The vast majority of what you said went WAY over my head, but the notion of averaging models for stats as if they were actual data being totally wrong I totally agree. June 18, 2013 at 8:03 pm What a brilliant application of scientific logic in exposing the futility of attempting to prognosticate the future with inadequate tools. It takes a measure of moral courage to expose fellow academics as morally bankrupt infants bumbling about in a dank universe of deception. Bravo! June 18, 2013 at 7:32 pm That. Is. Brilliant. Thank you. Only a couple of people seemed to understand what rgbatduke wrote. June 18, 2013 at 6:22 pm As I said on the other thread, what is lacking here is a proper reference. Who does this? Where? “Whoever it was that assembled the graph” is actually Lord Monckton. But I don’t think even that graph has most of these sins, and certainly the AR5 graph cited with it does not. Where in the AR5 do they make use of ‘the variance and mean of the “ensemble” of models’? Monckton pops in and thanks Nick Stokes for being gracious and coming to his defense. "implicit swindle in this graph — by forming a mean and standard deviation over model projections and then using the mean as a “most likely” projection and the variance as representative of the range of the error, one is treating the differences between the models as if they are uncorrelated random variates causing >deviation around a true mean!" Monckton somehow "forgets" to mention the variance he shows on his chart (see below). Monckton also admits to using a confidential draft AR5 chart, which if he was an expert reviewer he pledged to keep confidential. The AR5 chart itself has errors AFAIK and the public version will no doubt be different. Monckton shows his lack of moral fibre and his lack of grace. His behaviour shows he is not an upright citizen, an honest man of his word or a gentleman. Monckton is a bombastic ignorant fool who has lost his entertainment value. I've noticed that some people who are in the wrong are incapable of admitting it, and have a tendency to get very aggro. As if they think it will fool anyone but other fools. Monckton also has a very compartmentalised brain. It holds his lies and truths in different compartments but he can spout either or both at the same time, usually mixed with his misplaced self-righteous venom. June 18, 2013 at 7:01 pm Brown raises a potentially valid point about the statistical analysis of the ensemble, but his carbon atom comparison risks venturing into strawman territory. If he’s claiming that much of the variance amongst the models is driven by the actual sophistication of the physics that each incorporates, then he should provide a bit more evidence to support that conclusion. 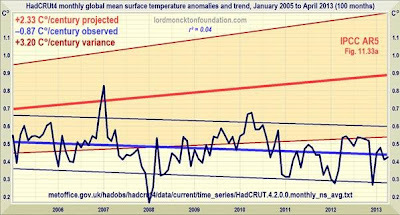 Here are the charts prepared by Christy, Spencer and Monckton that so offended rgbatduke, all the WUWT deniers and Anthony Watts, but which they are only now saying so. Here is a figure from the 2007 IPCC report - Summary for Policy Makers. The left panel is emission scenarios, the right panel shows multi-model means of surface temperature for different scenarios. The bars at the right show the "best estimate" surface temperature and likely range for 2090-2099. The best estimate is not the same as the model means you'll notice. Click to enlarge. I think rgbatduke is a little confused. He doesn't realize that the graphs were prepared by Monckton; he doesn't realize that the R-squared statistic he criticizes was prepared by Monckton and describes the linear fit to temperature (it doesn't apply to the models); and I don't think he understands the use of Bayesian statistics in modeling. There's a huge amount wrong with the content of his rant, and it speaks to a very weak understanding of how variable selection happens and why randomness needs to be inserted into these models. He also shows a lack of understanding of the limits of statistical modeling, when he suggests that you can't model a "non-linear" system with a linear model. Sixty two. One to do it and sixty one to co-author the paper. How many climate skeptics does it take to change a lightbulb? How many warmists does it take to change a light bulb? None. Just unscrew the light bulb and lower carbon emissions. Does anyone at the Other Place actually notice the things that are troubling about the Christy graph? The way Christy calls TMT the "bulk troposphere" when it isn't? The fact that it's not really clear how Christy got TMT temps (if that is what they actually are) out of KNMI Climate Explorer in the first place? That the models are forced by RCP8.5? The dubious averaging of RSS and UAH? The absence of discussion of why the two satellite recons are so very different? The absence of discussion about the reliability of the tropical radiosonde data? Etc. Nobody spotted any of this? > That the models are forced by RCP8.5? That makes very little difference, as there isn't a lot of future time in the graph. What I would add: that all satellite and radiosonde data sets sample the same, single realization of real-world natural variability, well known to (globally) trend low? Not really. The radiosondes actually attempt direct thermometry while satellites produce a synthetic reconstruction based on multiple channel MSU data and a fairly complex model. Nor is this a *global* measurement as you say. It is tropics: 20N - 20S. What do you mean? 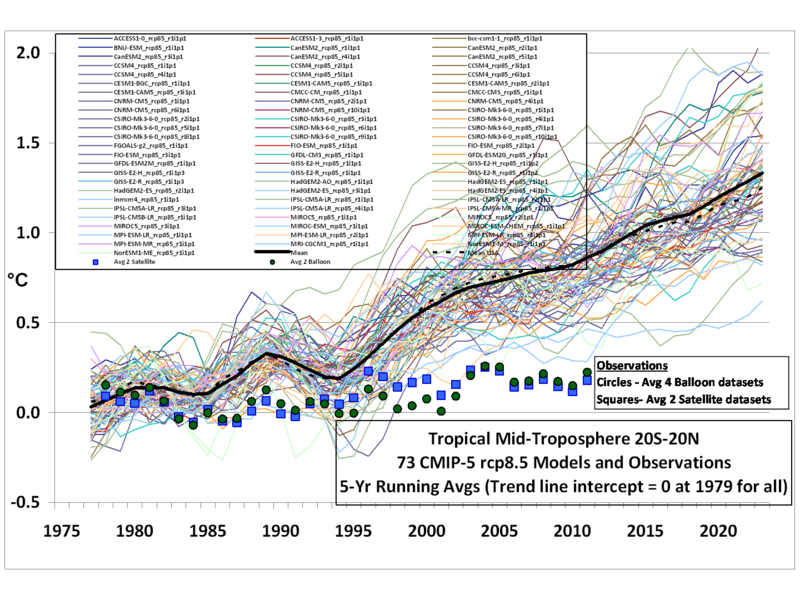 All these measurements are of the real tropical Earth middle troposphere over the last few decades, and there is only one of those, right? And yes, the satellite "measurement" is complicated enough to be actually called a modelling effort. And while the radiosonde measurements are "direct", surely you are aware of the sensor issues with radiosondes. That isn't a citation. You assert that forcing the models under RCP8.5 "makes very little difference" presumably compared to the same time period forced under a lower emissions scenario eg RCP4.5. Please stop asserting and start citing. I am aware that neither the sondes nor the MSU reconstructions are considered robust. I think that certain people are making strong claims based on weak evidence. That is all. Fair enough. The rest stands as is. BBD, look at the graph above named "Spencer & Christy's Spaghetti". The data goes to 2012, the graph to 2025. That's 13 years. 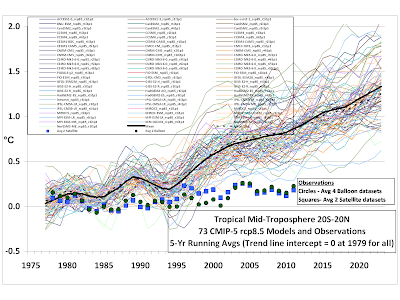 Now you can look at any publication showing temperature projections for the various RCPs: they will not diverge from each other, or from simple linear extrapolation for that matter. Temperature rise has been, apart from natural variability, linear for the last 30-odd years, and that won't change in just 13 years more. You're asking for a citation for textbook (or tacit) knowledge. BTW did you appreciate my argument that we have only one realisation of the real climate, from which both the radiosonde and the satellite "observations" are drawn? It is a rather essential point. I did not recognise your name or I would have read and thought about what you wrote more carefully. More objectively. Christy's history of misrepresentation makes me not angry but furious, and I had decided - mistakenly - that you were defending or at least excusing it. That's OK BBD. I also tend to lose my temper in those situations -- not good. BTW the dirty trick of forgetting that all the observational data comes from a single "run" of the real climate goes back to Douglass et al. --- it's really a golden oldie. Perhaps that's why I am sensitized to it. [sigh] We don't change lightbulbs, we replace them. All I can say is its the upward trend is accelerating but I could give you an estimate based on the mean, mode, and median for the last ten lightbulb changes (p=0.5), er, I mean replacements. I just checked out the wikipedia entry on ensemble forecasting, and it makes it pretty clear that Brown doesn't know what he's on about. I think Brown is labouring under the impression that given enough time and knowledge we could model the atmosphere deterministically. It's sad to see a physicist get physics so wrong. Brown works in a completely different area of physics, far removed from atmospheric physics or other physics associated with earth systems science. He might as well work as a boot-shiner, osteopath, barber or neurologist for all the good his own specialist knowledge is to him in relation to climate. Given his appointment at Duke, I'd say he has the ability to learn about climate science should he want to do so. Whether he chooses to or not is another matter. He might do a Muller. I don't think he is of the same calibre as Muller scientifically, but he is a 'denier' in the fashion of Muller. Probably his brain functioning is constrained by his ideology like Muller, Curry, Pielke, Tol etc. I can't see him having much influence beyond a couple of denier blogs. He's not a heavyweight from what I can tell. RGB has wide-ranging interests. But on stats, the statistician to the stars felt a need to say something. How many paranoid conspiracy theorists does it take to change a light bulb? How many punks does it take to change a light bulb? The classic how many Microsoft engineers...? RGB destroys the warmist models. Not quite what this blog misleadingly portrays. Unlike WUWT my comment will be expurged here no doubt. I enjoy tussles. Do come back and say what it is about rgbatduke's "comment" that you find compelling. Since you seem to be interested in the topic, you may get a kick out of this. It has links to all the other "skeptics" fighting with each other over who's right and who's wrong. On the other matter you raised, it's only extreme infringements of my comment policy that gets posts deleted here. My comment policy is much shorter than WUWT's and doesn't include any hidden unstated policies. Incidentally, I wasn't going to publish my current draft article, but have changed my mind. You might be interested in this article as well.